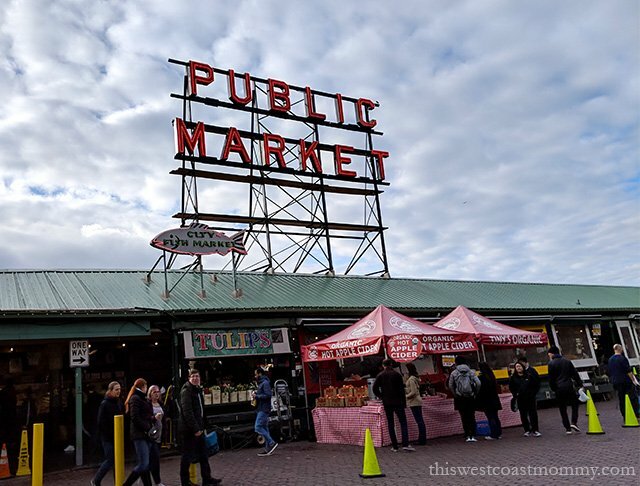 One of the loveliest cities in the United States, Seattle is nestled in the heart of the Pacific Northwest along the west coast of Washington State and about a two-hour drive from the Canadian border. Located between Puget Sound and Lake Washington, Seattle is surrounded by water, forests, and mountains, and set against the backdrop of the Pacific Ocean and majestic Mount Rainier. Seattle’s location on the water means the city enjoys mild climes year round. Around here, winter temperatures rarely drop below zero (or 32 degrees Fahrenheit as Americans measure it), which means rain instead of snow. Seattle’s rainy season runs from November through to March, but you shouldn’t let that deter you from planning a visit to the Emerald City. You may not be spending a day at the beach, but there’s still plenty of fun to be had! 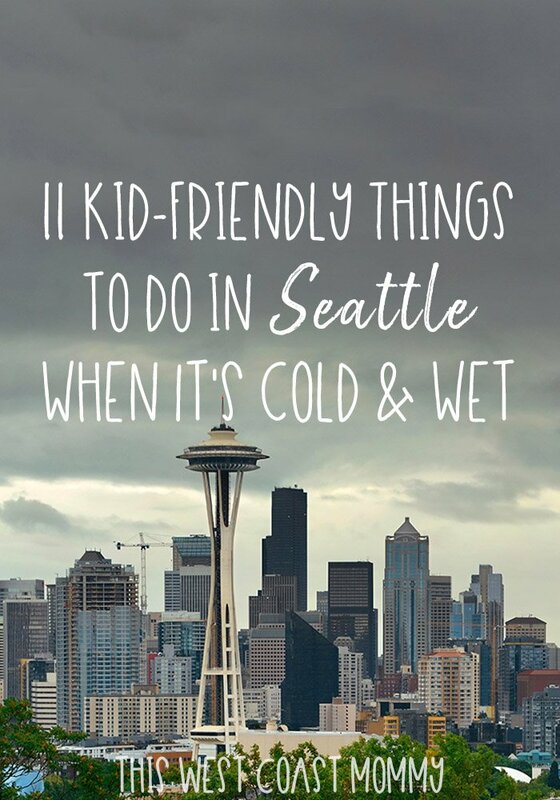 We took a weekend road trip to Seattle last month, and here are our recommendations for kid-friendly things to see and do around Seattle, even when the weather is cold and wet. You can’t visit Seattle without touring the city’s most well-known landmark. Rain or shine, viewing the city from 520 feet up and through the world’s first and only rotating glass floor is a thrilling experience. Built in 1962 for the World’s Fair, the iconic Space Needle has been recently renovated and updated. With your admission you’ll get a group photo op before heading up the elevator, and once at the top scan your ticket at the selfie station for a photo with the city in the background, but be sure to pick up the kids if you want more than the tops of their heads in the picture. Both photos will be available for you to download for free after your visit. 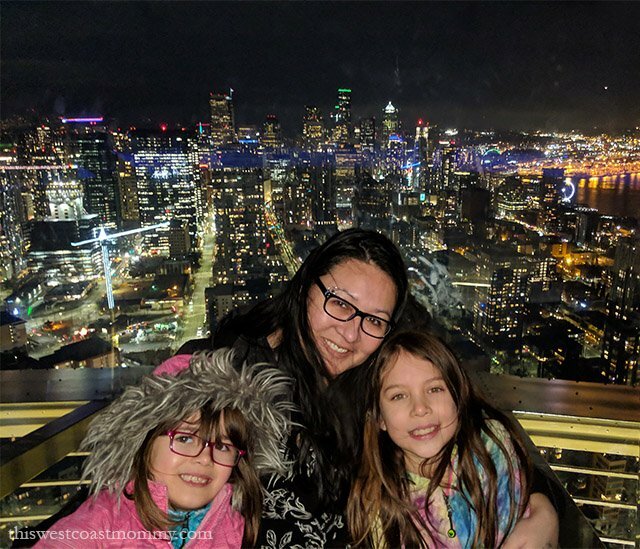 Admission can be pricey though, so if you’re considering visiting any other attractions in the city, I highly recommend that you consider purchasing a Seattle CityPASS (more on CityPASSes below). When you come back down the tower, you’ll exit through the gift shop (naturally). Located in the shop is a short virtual reality “ride” included in the price of your ticket. Staff will fit VR goggles on you and send you on a 45-second trip up and down a virtual Space Needle. There was no minimum age when I asked, and my 6-year-old wasn’t frightened by it at all. I wouldn’t pay extra, but the VR ride was a fun bonus we weren’t expecting. 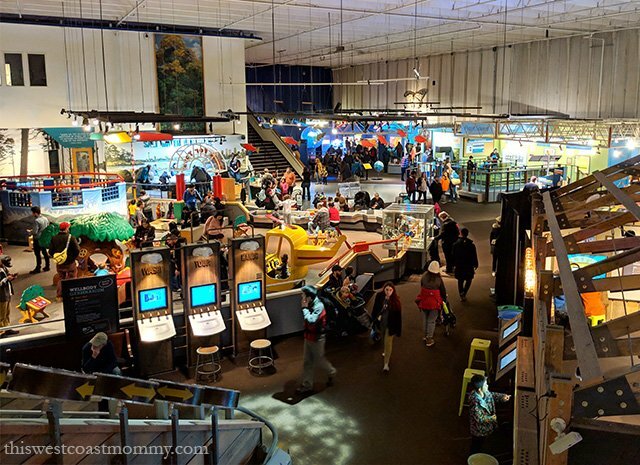 The Seattle Children’s Museum is a smallish space in the basement of the Armory Building at Seattle Center. 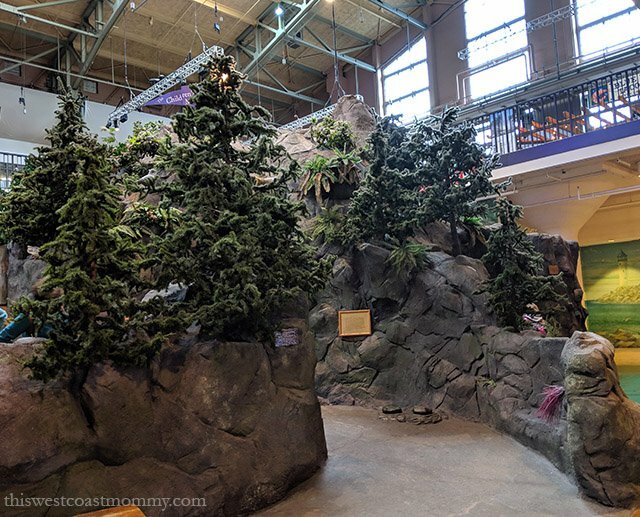 The museum brings the city and the big Pacific Northwest outdoors inside and scaled down for kids to explore. 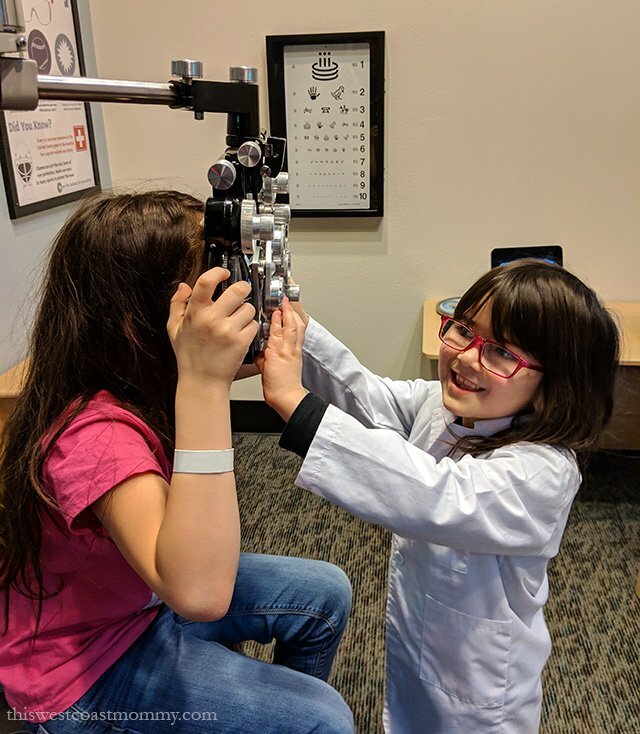 The Neighbourhood gives kids the opportunity to become mail carriers, practice giving eye exams, ring up some groceries, or drive a fire truck. There’s also a bus stop and bus, hardware store, cafe, and theatre complete with stage, sound booth, and ticket window. In Cog City, kids can explore motion, velocity, gravity, and balance through play and experimentation. This exhibit also has a large soft-play area where little ones can safely explore while older siblings enjoy the larger exhibit. The Mountain exhibit will take you on a Northwest adventure without the rain. Climb the mountain and learn about native Washington plants and animals, explore a bat cave, search for creepy crawlies under rocks, and even slide down a glacier. The Imagination Studio was closed during our visit, but this area allows budding artists to exercise their creativity. It’s a popular activity, so on the days it’s open be sure to pick up your time-tickets when you arrive then plan your visit around your time slot at the Studio. 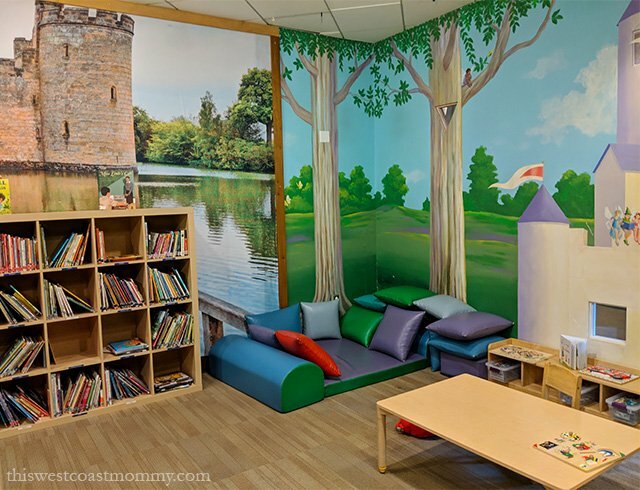 When the kids are ready for some downtime, visit the Story Telling Circle room where they’ll discover an enchanted forest with comfy kid-sized chairs and a wall of books to choose from. There are a couple of toddler-friendly play areas for even the youngest visitors – the soft-play area at Cog City and Discovery Bay, a Pacific Ocean-themed play area designed for babies and toddlers three years old and under. Don’t miss the train tables at the Sound Transit Station. Despite the museum’s smaller size, we found so much to do here. The kids were occupied for well over two hours, and we could easily have stayed for longer. I would say this is best for kids under 11. If the rain holds off, take the kids to the Artists at Play Playground between the Children’s Museum and the Museum of Pop Culture. This amazing and engaging play area boasts a 30-foot climbing tower, labyrinth, human-powered accessible carousel, musical instruments, listening stations, sound swings, and play mounds. 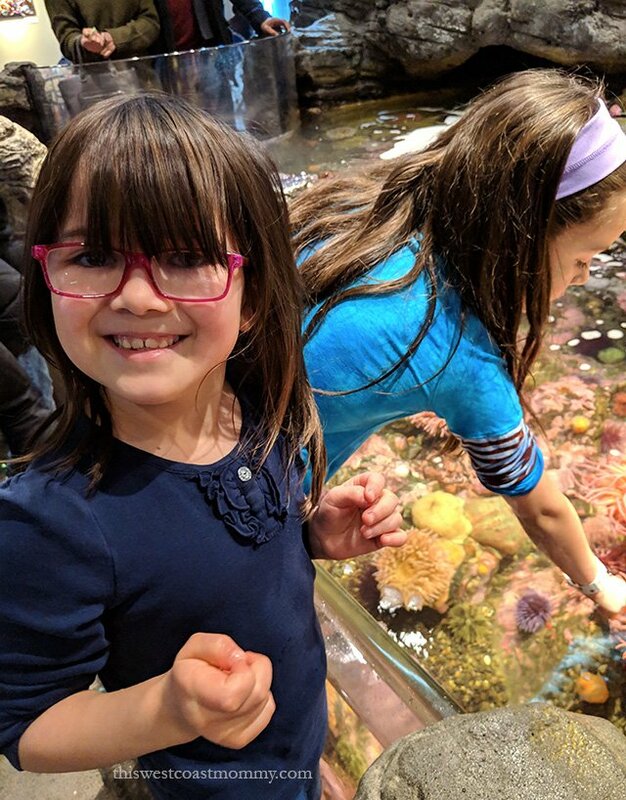 We’ve visited the Pacific Science Center a few times throughout the years, and there’s always so much fun and learning to be had as we explore the wonders hidden in the vast reaches of our galaxy down to the life cycles of the tiniest insects. The Pacific Science Center’s Willard Smith Planetarium has multiple live presentations a day. Tickets are free but space is limited so the first thing you should do upon your arrival is to visit the box office and pick up tickets for an available show time. Go enjoy the rest of the Science Center and set an alarm to come back 10 minutes before the show. Visit the animatronic dinosaurs, explore the saltwater tide touch pool, stand inside a giant guitar, and hang out with naked mole rats. 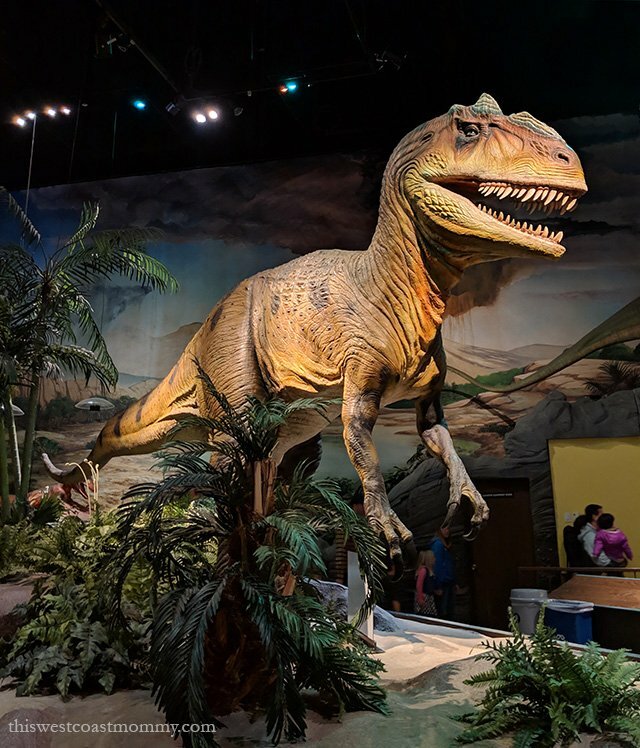 All three buildings are chock full of interactive displays and engaging exhibits that will keep the entire family engrossed for the whole day. Don’t miss the live science shows in Building 1 across from the Information Desk, and be sure to set aside 20 minutes or so to walk through the butterfly garden. There’s often a line up to get in, but fortunately there are lots of insect and bee exhibits nearby that the kids can explore while you’re waiting. 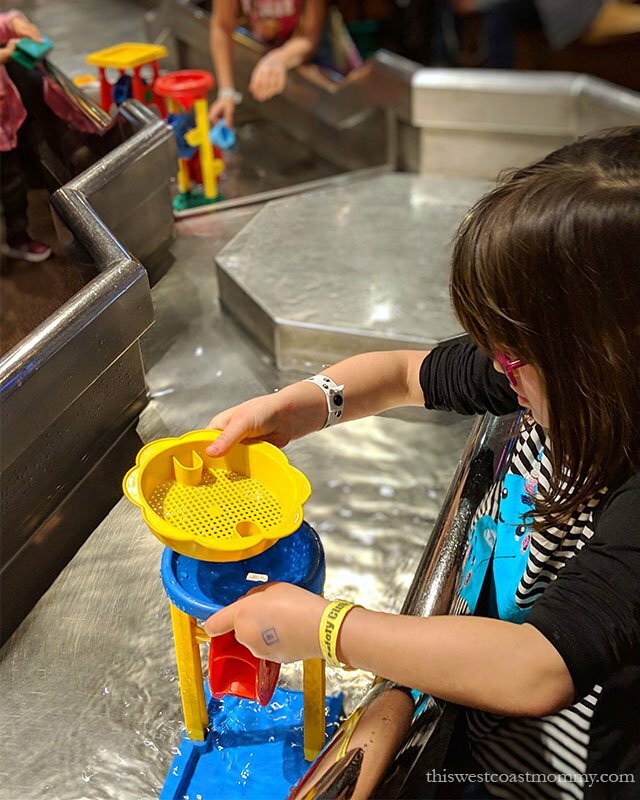 For the youngest scientists, there’s a Just for Tots area where they can learn about cause and effect, play with musical instruments, and experiment with water at the stream table. Laser dome and IMAX shows are also available for an additional cost. Once you’ve visited the attractions at Seattle Center, head down to the Waterfront for even more kid-friendly fun. 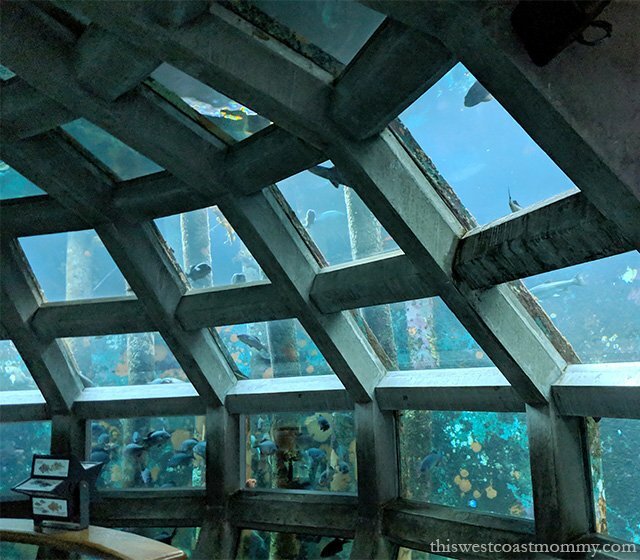 Centrally located on Pier 59, the small footprint of the Seattle Aquarium makes it a very manageable attraction even for small children. Just inside the door is a large open area and a huge “underwater window” that will hook kids (and adults) immediately. Further in you’ll find multiple touch pools highlighting local sea life, staff-led demos, a plexiglass arch with moon jellyfish inside, and a dark gallery full of colourful fish and corals. For kids in need of a break or a quieter low-key activity, there’s also a small reading area and a large felt board. Despite its compact size, there’s plenty to see and do. Kids will love spotting all the colourful fish and corals and the giant shark lurking along the ceiling. The kids got a kick out of the underwater dome where they could watch fish swim overhead. Larger mammals at the Aquarium include harbour seals, Northern fur seals, sea otters, and river otters. Even when it’s pouring rain, almost all of the viewing areas are under cover so you can still stay dry. And then there’s Pike Place Market, home of the famous flying fish market and an amazing place to spend a rainy day. You’ll find lots of shopping, places to eat, artisans, and craft stands. Hang out for a while and watch the fishmongers sling whole fish around the fish stall. The kids loved browsing the craft market and checking out the handmade stuffed animals, puppets, and art. Downstairs you’ll find three more levels and dozens of storefronts. 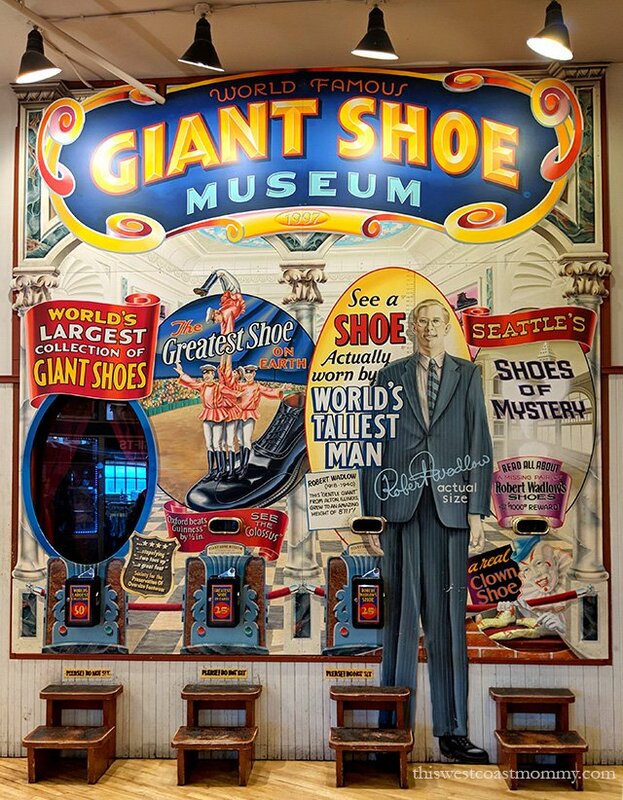 Some kid favourites include the Market Magic Shop, the Giant Shoe Museum with old timey coin-operated peep shows outside Old Seattle Paperworks, 3D Wood Puzzles, Golden Age Collectables (which bills itself as the world’s oldest comic shop), and Sweetie’s Candy. We also spent time at Lamplight Books which carries a large selection of gently used books, including a nice collection of children’s books. It’s a great place to pick up some classics or new favourites for bedtime reading. Tucked away on the third level is Rummage Around, a junk and rummage store packed full of affordable items the kids can comb through and spend their allowance on. There’s lots of junk, but with a little bit of effort, some treasures too like vintage buttons or gently used toys. Other shops that kids might enjoy include the Miniature Car Dealers and Orange Dracula 5 & 10 which bills itself as “the Woolworths of Weirdos.” For lovers of everything purple, The Purple Store is half a block up the hill on Stewart Street. And of course kids will get a kick out of adding their own personal touch to the kinda gross but colourful Gum Wall located in Post Alley under the Market . The same activities that keep your toddler, preschooler, or younger child busy might not appeal to your preteen or teenager as much. 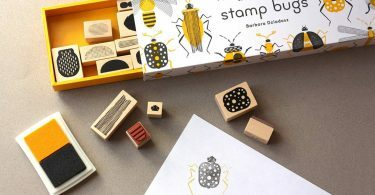 Many of the options outlined above are good for all ages, but here are a few more options that your older kids might also enjoy. 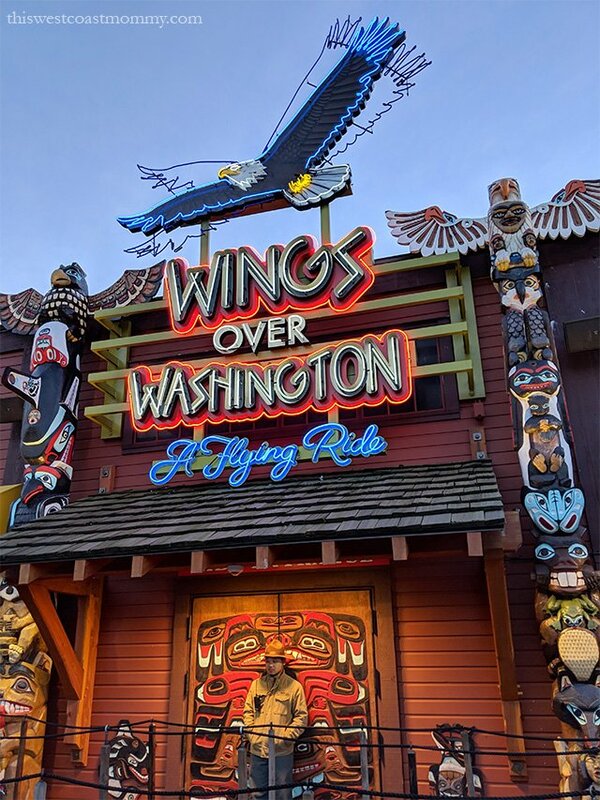 Just a couple of minutes down the road from the Seattle Aquarium, on Pier 57 (Miner’s Landing), you’ll find Wings Over Washington. This 15-minute virtual reality experience will take you on an amazing virtual flight across the state of Washington on the wings of a “spirit eagle.” While the minimum height is 40″, this is probably most appreciated by slightly older kids. 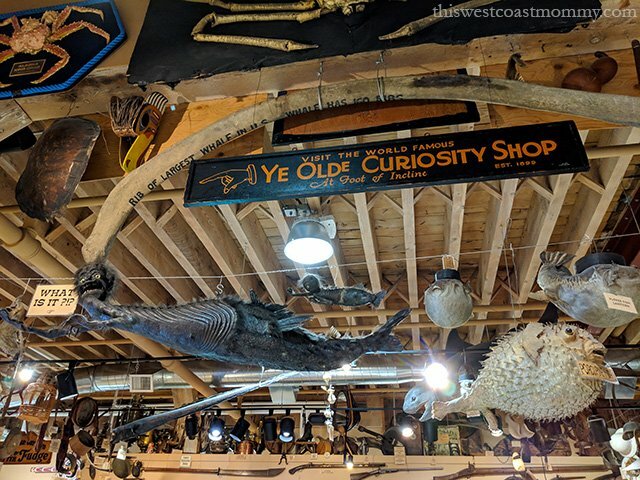 Located on Pier 54, Ye Olde Curiosity Shop has been in operation on the Seattle waterfront since 1899! A combination novelty shop and museum of oddities, this is a must-see free attraction for older kids. It’s a lot of fun to walk down the aisles crowded with the weird and bizarre, one of a kind objects, and other rare finds. This is really better saved for older kids as the younger crew may find some items (think mummified bodies, shrunken heads, and two-headed animals) frightening or disturbing. Back at Seattle Center, older kids and teens will enjoy a visit to the Museum of Pop Culture (MoPOP) formerly the Experience Music Project. The exhibits may not interest the Wiggles set as much, but your teen will likely enjoy the music and cultural exhibits. 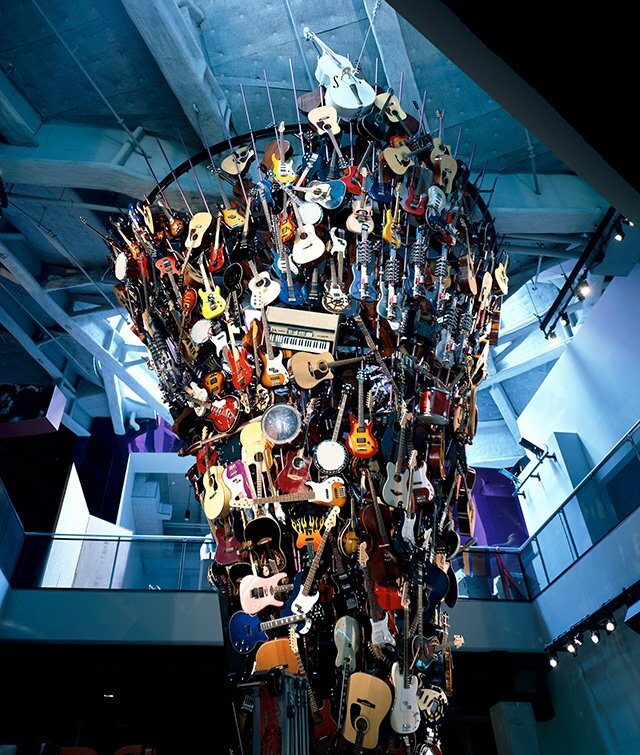 Seattle superstars Nirvana, Pearl Jam, and Jimi Hendrix have their own exhibits of course, and the Sound Lab’s multimedia installation allows visitors to explore rock ‘n’ roll experientially through electric guitars, drums, samplers, mixing consoles, and more. Other family favourite exhibits include the Science Fiction and Fantasy Hall of Fame honouring the genre’s most siginificant creators and creations, and Fantasy: Worlds of Myth and Magic exploring some of the most popular works of fantasy of our time from The Wizard of Oz and The Princess Bride to Harry Potter. 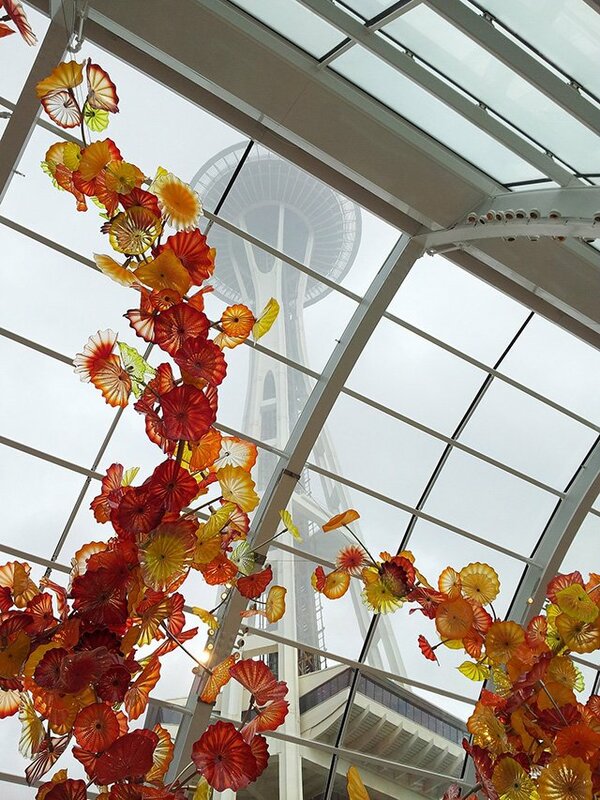 Also located at Seattle Center, Chihuly Garden and Glass should not be missed. Dale Chihuly’s massive blown glass sculptures are luminous wonders of colour and art. His work is housed in the Exhibition Hall and in the 40-foot tall, glass and steel, light-filled Glasshouse. More examples of his work can be found in the outdoor Garden surrounding the Glasshouse, but even on the blusteriest days there’s plenty to see inside. 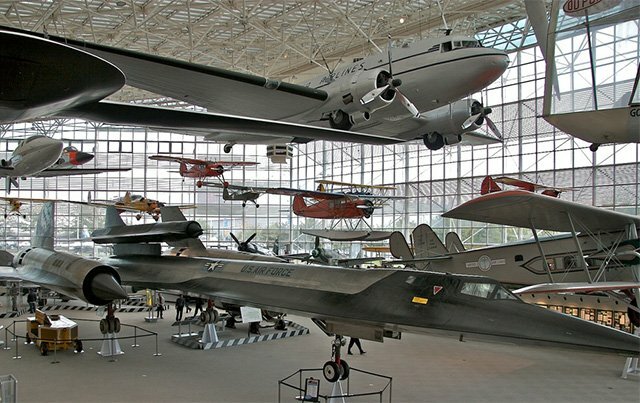 Located about 15 minutes south of downtown Seattle, the Museum of Flight holds an incredible collection of aircraft, spacecraft, artifacts, galleries, exhibits, facts and stories that inform visitors about the past, present and future of flight. Learn about the history of flight and space travel. Check out the museum’s collection of WWI and WWII fighters. Get up close to a Lockheed M-21 Blackbird and a mock-up of a Lunar Roving Vehicle. Once you’ve walked through all the exhibits, add to your adventure with an interactive tour or flight experience at an additional cost. Try your hand at the flight simulator or take a 30-minute private tour of the Space Shuttle Trainer Crew Compartment (10 years and up). Find out what it’s like to be part of a space exploration mission on a Mission to Mars (11 years and up) or catch a 3D movie. 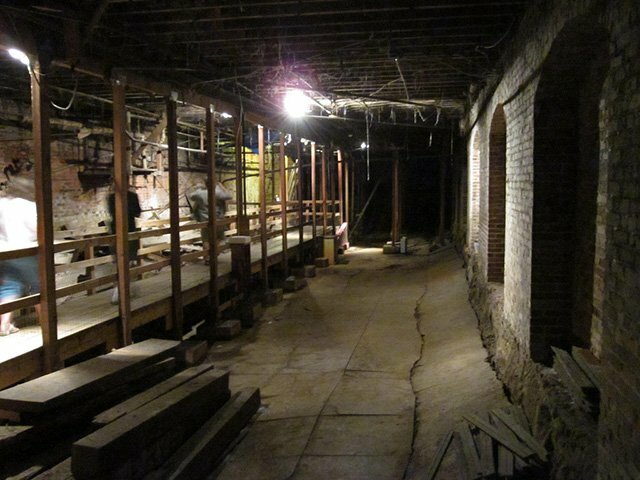 Rainy days are the perfect opportunity to take a tour of the Seattle Underground. This network of underground passageways and basements is located under Pioneer Square, the original heart of Seattle. 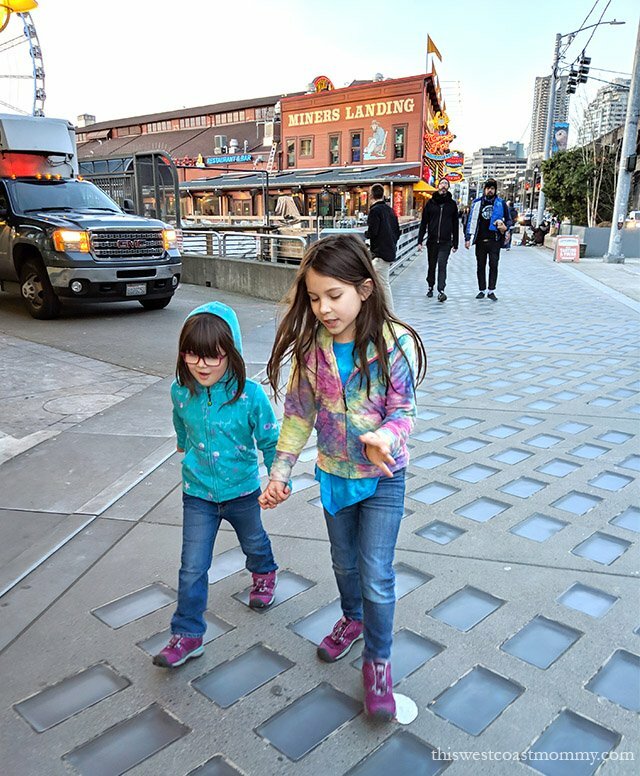 These passages were at ground level when the city was built in the mid-19th century, but once the streets were elevated after the Great Seattle Fire in 1889, the passages fell into disrepair until they were restored and opened up to intrepid explorers. Several years ago I took Bill Speidel’s Underground Tour with some friends, and we all thoroughly enjoyed the experience. Our guide regaled us with plenty of colourful stories that really brought the history of pioneer-era Seattle to life. Since then, another tour operator, Beneath the Streets, has started offering tours as well. Recommended for ages 8 and up. Since most of the touristy attractions are clustered around two major areas – either Seattle Center or on the waterfront – my recommendation is to get a hotel within walking distance of either. Parking can be hard to find, so we prefer to leave our car at our hotel and walk wherever we need to go. There are more hotels to choose from in the area surrounding Seattle Center, but either way, you can take the Seattle Monorail between the two neighbourhoods to see everything. Like the Space Needle, the Seattle Monorail was built in 1962 for the World’s Fair. The Monorail has only two stations: one at Space Needle-Seattle Center and the other at Westlake Center near the waterfront (four blocks from Pike Place Market). The city also offers a free waterfront shuttle along the waterfront and up to Seattle Center, operating until Labour Day 2019. Check the website to see if it’s still up and running after that date. Note that Uber drivers in Seattle don’t offer car seats or booster seats so you’ll need to bring your own if that’s part of your travel plans. 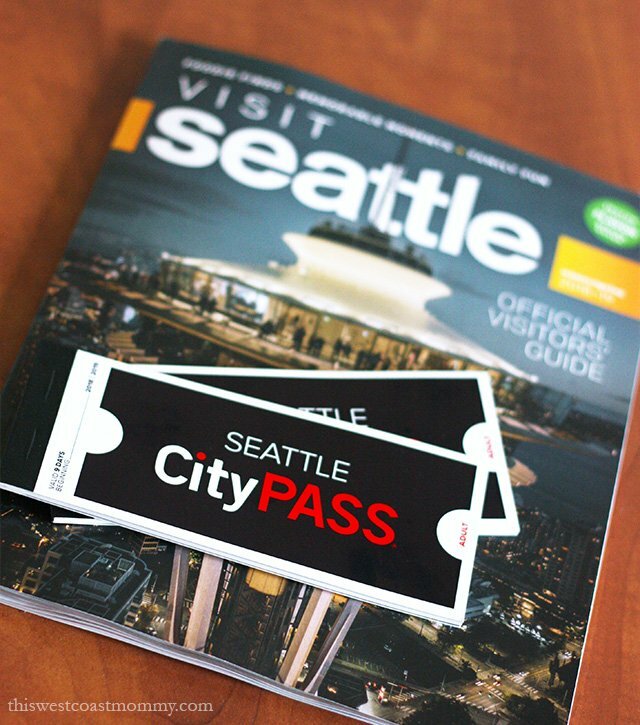 If you’re planning a visit to Seattle and want to do all the touristy things, a CityPASS is a must. This little booklet contains passes that will get you in to the most popular attractions for 46% off. If you only visit the Space Needle, the Seattle Aquarium, and MoPOP, you’ve already saved money. 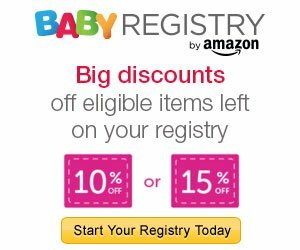 Valid for nine days from your first use, Seattle CityPASSes cost $99 USD for adults and $79 USD for children (5-12 years). Your Seattle CityPASS gets you admission to the following attractions as well as additional discounts and deals at attraction gift shops. You can either buy CityPASSes online, or pick them up at any of the participating attractions. Disclosure: I received complimentary CityPASSes and admission to the Seattle Children’s Museum to facilitate this post. Nevertheless, all opinions expressed are honest and my own. Your experience may differ. I’m bookmarking your post for future! 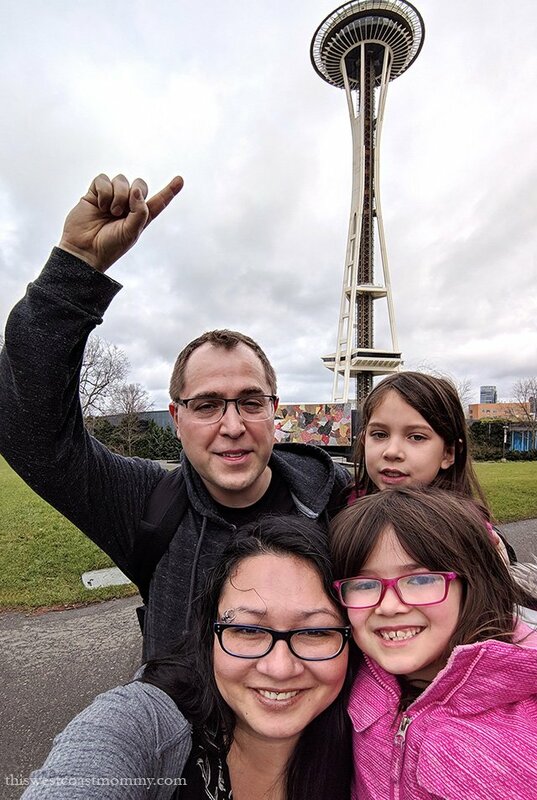 We have family near Seattle that we really want to visit, and I know we’ll be looking for some child-friendly activities. For our big family, the CityPass definitely sounds like the way to go. Thanks a lot for this information. It is very useful to most of the families in Seattle. 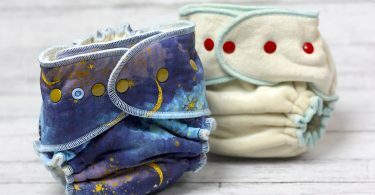 Thank you for this awesome blog! We are coming to Seattle in late June with kids age 5 and 7 and we’re thinking that we’d like to take a day trip to Mount Rainier park. Is that a doable goal? Any suggestions for how to get there from downtown Seattle? Thank you for visiting, Olivia! Ye Olde Curiosity Shop placed a few oddities in the front entrance, just so parents will see what they are getting into and gauge how their kids may react. Those who can brave the strangeness have an interesting time in store for them. Plus… free fudge samples! LOVE going to Seattle with the family!! Thanks for all the fun tips on things to do!! What a great list of things to do in Seattle! I think one could enjoy most or all of these even without little ones in tow. LOL I will keep these ideas in mind on a (hopefully) second visit to Seattle!